Just before Christmas 2016, Cypren Edmunds (Chair of Highpath RA) chaired a meeting between the residents of Highpath and the two executives, Austin Reid & Neil McCall from Clarion Housing (the merged Circle Housing & Affinity Sutton housing associations). Also in attendance was Paul Quinn, Merton Regen director. What you’ll view on YouTube is the footage of the whole meeting. 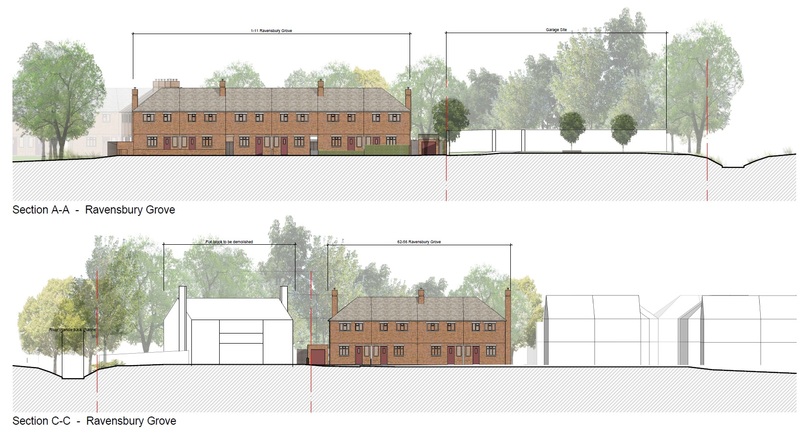 Here’s some drawings from the proposed Ravensbury Garages redevelopment plan that is currently awaiting review by Merton Council’s planning team – application 16/P1968. You have until 21st June 2016 to get your responses into Merton Council. This is considered to be Phase 1 of the regeneration strategy put forward by Circle Housing. Don’t forget that tomorrow evening we have the Ravensbury residents meeting from 7pm in the hall on Ravensbury Grove. We’ll be discussing Circle Housing’s planning application to build a pair of 4 storey flats next to Ravensbury Park, destroying our green space just there forever, plus another 7 houses – all of these on ground that is 1m higher than the estate, thus substantially blocking our view of the tree line that is integral to the character of our neighbourhood. 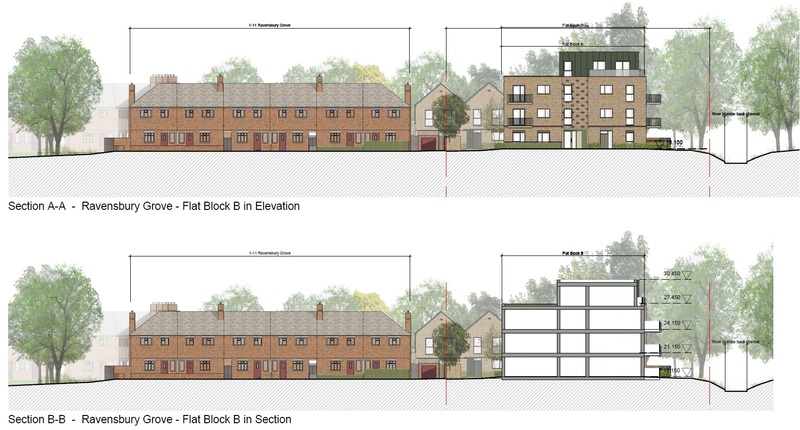 Our opinion is that this application should be refused because of the massing, heights, removal of green space (serving also as a public amenity space), effect on the character of our estate & removal of an important view & setting, potential parking problems, and very importantly the effect on the adjacent Ravensbury Park area – an important area of conservation in Merton – amongst other things. Remember that anyone can respond to the planning application, you don’t have to live right next to the site. Remember also that, if granted, we’ll be without parking on Ravensbury Grove for 12-18 months. In Circle’s planning application they say they’ve considered residents views. It seems that they haven’t actioned the views that they disagree with though. We call this a cherry picking consultation. See you in the hall tomorrow from 7pm. Unfortunately CHMP are applying to destroy the green space between Ravensbury Park and “Ravensbury village”, thereby destroying an public amenity area that is also key to our area’s character. Placing flats on this space will block out the view of the park, remove a key green space for Ravensbury and jeopardise the very essence of our home area. 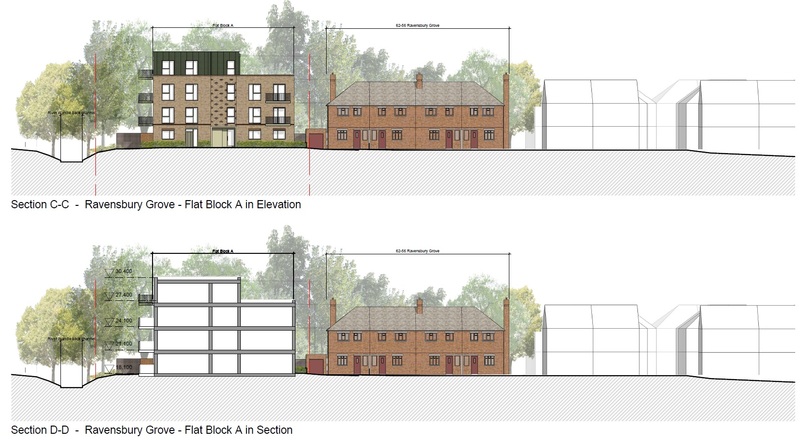 This planning application for Ravensbury will be decided against the policies in Merton’s current Development Plan, unless other relevant information, know as “material considerations”, indicate otherwise. “Material considerations” can be anything planning-related, ranging from finding a protected species on the site to a Ministerial statement which changes the direction of one of the council’s policies. This week residents received a letter notifying Circle’s push for planning on the garages site AHEAD of the end of the council’s own consultation (expected in 2017). Does this represent fair process or is it effectively an abuse of process? Does it represent due consideration of residents and their area by a fair minded housing association or is it effectively a wilful push for redevelopment & an attempt to subvert fair & proper procedure?